I have been participating in the year-long project known as the Beaded Journal Project, or BJP, started by Robin Atkins. You can see all of my pieces on the BJP website. When they were all finished, I needed to figure out how to mount them. 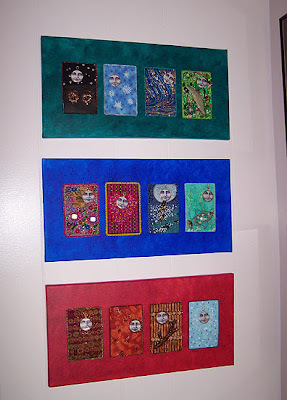 I used 12″x24″ gallery-wrapped Frederix canvases to mount my the pages. Each one is 6″x4″, so this left plenty of space around them. 1. 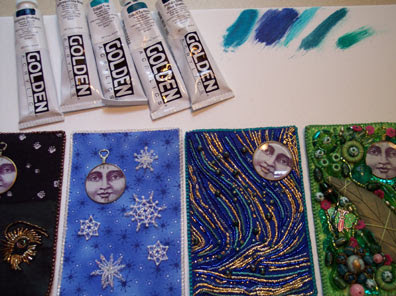 Arrange beaded cards as they will be on the canvases. Mine are arranged by month: otherwise I may have grouped the colors somewhat differently. 2. Test the colors that you plan to use. I only ended up using one color on each canvas, despite the mottled look that they have. 3. Sponge on a first thin layer of color. Apply it in wide sweeping circles. 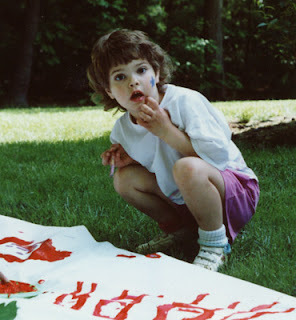 As soon as it’s tacky dry, apply a second layer, not covering the canvas evenly, but allowing darker spots to form. I used slightly smaller circular sponging to accomplish this. 4. Let them dry at least overnight so that your work won’t stick to the acrylics. 5. Pin the pages in place and stitch them on from the back. Heavy pages will need extra stitching spots to avoid drooping later on.